Meet the impressive sounding Vodafone Smart 4 Turbo and Smart 4 Power, the latest handsets to bear Big Red's name and this time there's 4G inside. Vodafone is no stranger to own-brand handsets, but the Smart 4 Turbo and Smart 4 Power are the first to arrive with 4G capabilities. You can get your hands on the Vodafone Smart 4 Turbo now, which boasts a 4.5-inch display, 1.2GHz quad-core processor, 1GB of RAM, microSD slot, 5MP rear camera, front cam and Android 4.4 KitKat. It'll set you back just £135 on PAYG, but you'll need to fork out £31.50 per month if you want it on the Red 4G plan with unlimited texts and calls and 4GB superfast of data, which is pretty steep for what is being billed as an affordable handset. 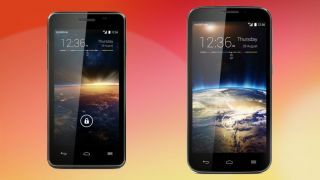 The Vodafone Smart 4 Power will be "available soon" and boasts a larger 5-inch HD display, 1.3GHz MediaTek quad-core processor, 1GB of RAM, microSD slot, 5MP rear camera, front snapper and Android 4.4. There's currently no pricing for the Smart 4 Power, but it will be more expensive than the Turbo. The Smart 4 Turbo provides direct competition to the £99 EE Kestrel which offers up 4G support alongside a 4.5-inch display, 1.2GHz quad-core processor, 1GB of RAM 5MP rear camera, microSD slot and Android 4.3 - oh and don't forget about the Motorola Moto G 4G either.